LINCOLN PARK — Covering up freezer burn on a cardinal or a split lip on a polar bear is just another day on the job for Steve Sullivan. As the resident taxidermist for the Peggy Notebaert Nature Museum, Sullivan cares for the more than 250,000 specimens in its collection. When the museum needed a Northern cardinal on display as part of its "Birds of Chicago" exhibit, Sullivan pulled out a specimen that had entered the collected 20 years prior — and been frozen ever since. "When you look at it, you'll see that its kind of coyly looking over its shoulder at you, because the way it was freezer burned, to position the head in any other way, it would have looked like it had crazy cow licks," said Sullivan, who is the senior curator of urban ecology for the Chicago Academy of Sciences. Next week, curious Chicagoans have the chance to learn the art of animal preservation from Sullivan in a hands-on workshop. The taxidermy workshop, which takes place Thursday and Friday evenings, is the second for the museum after a successful run in October. 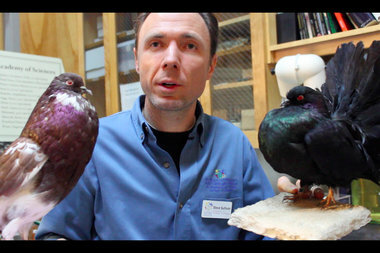 The two-day, 10-hour class ($300) will have students turn a thawed carcass into a stuffed and mounted pigeon specimen. "It takes a lot of commitment, but I think you end up with a neat product, and this is the kind of mount that we'd use here in the museum," Sullivan said. The museum usually has a few hundred animals on rotating display, but its behind-the-scenes collection of stuffed animals — many used solely for scientific studies — are kept in a less presentable state. “It arguably looks a bit like road kill,” Sullivan said of the splayed squirrels and birds arranged on their backs. The display mounts in more lifelike poses: crouching foxes, perched birds, a grazing deer. That's where the creativity and artistry of a taxidermist comes into play, Sullivan said. "We hope to make a class that is both scientifically fulfilling and artistically fulfilling," he said. Registration information for the taxidermy workshop can be found here.